When António Guterres started as UN Secretary General, he emphasised that conflict prevention had to be a top priority of the United Nations. 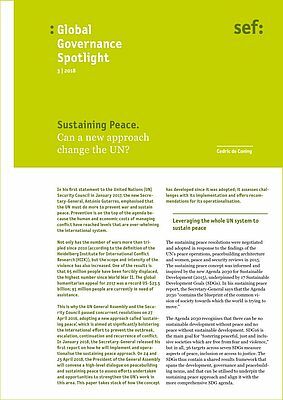 This is why the United Nations are currently working on specifying the new ‘sustaining peace’ approach, passed by concurrent resolutions of the UN General Assembly and the Security Council in 2016. What are the challenges with their implementation? How does the current geopolitical situation impact the concept? And does it have the potential to make the UN fit for the 21 century? Cedric de Coning from the Norwegian Institute of International Affairs (NUPI) in Oslo provides an overview on the challenges and chances the UN is currently facing within this process.